On average, European offshore wind turbines stand in 29 meters (95 feet) of water about 44 kilometers (27 miles) from the shore, WindEurope reports. These two stats underscore one of the key reasons why offshore wind in U.S. waters is a flyspeck compared to the installed capacity of European wind farms. The first U.S. offshore wind farm added a scant 30 megawatts of electrical capacity when construction wrapped up in 2016. By contrast, grid-connected capacity of European offshore wind farms rose by more than 1,600 MW in 2016 alone — with 338 new wind turbines expanding total capacity to 12,600 MW, according to WindEurope. European leaders deserve plenty of credit for achieving bold offshore-wind goals, but that’s not the only force at work in Europe’s offshore-power dominance. The waters of the North, Irish, and Baltic seas tend to be shallow near the shoreline and fall gradually to maximum depths. This is the optimum terrain for today’s offshore-wind technologies — and it’s abundant. By contrast, the entire west coast of the U.S. plunges deeply into the Pacific Ocean just off the shoreline. The continental shelf on the Atlantic Coast and the Gulf of Mexico is much larger and shallower, but the specter of summer hurricanes casts a cloud on projects in warmer southern climes. In essence, the most promising proposals for wind farms in U.S. waters lie in the cooler waters from the Carolinas northward to Maine. These waters boast a gently sloping continental shelf, much like the areas dotted with wind farms off the coast of Northern Europe. And while these northern waters are no strangers to fierce storms, they generally do not experience the destructive force of hurricanes. Europe’s massive lead over North America in offshore wind shouldn’t obscure one central fact: European countries have fulfilled only a fraction of their offshore-wind power goals. And, like an apple tree bereft of low-hanging fruit, they have already developed many of the most valuable offshore-wind sites. As offshore wind projects move farther from the coastline in Europe, naturally the water gets deeper. Soon, the fixed foundations for wind turbines will become prohibitively difficult to manufacture and install. This challenge invites the development of floating offshore wind platforms. Floating platforms sound promising on paper, but only a few demonstration projects have gotten off the drawing board. But that could rapidly change in the space of a few years, according to WindEurope, the trade association for European wind power. In a report issued in June 2017, WindEurope stated that floating platforms are ready for commercial development, and that costs could soon plunge as the technology enters the mainstream. The report listed seven floating-platform projects in the works in Scotland, Ireland, Portugal, France, and the UK with nearly 350 MW of capacity that are expected to be commissioned in the next four years. PMI has long provided premium cable accessories to oil-development companies, so we have a healthy respect for the difficulties in extracting energy from the deep ocean. And we’ve admired the ability of our industry partners to overcome these challenges. But accidents happen despite the best efforts of the industry. Though floating offshore wind farms pose their share of environmental threats, there’s little chance of them being blamed for massive oil spills. 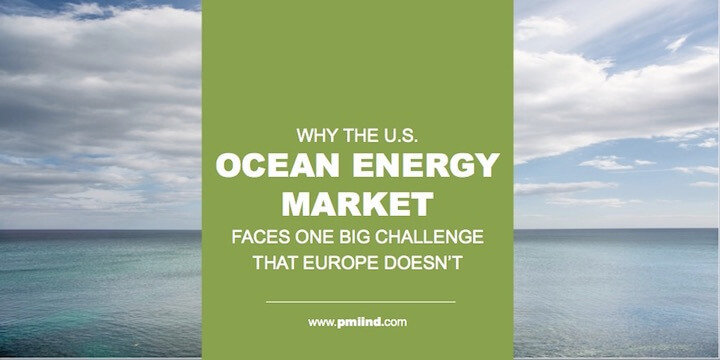 That’s one of the best reasons to be optimistic about the potential of offshore wind in the U.S. And as European developers build out floating platforms and drive down costs, American developers would be well advised to take advantage of the inevitable innovations that emerge.